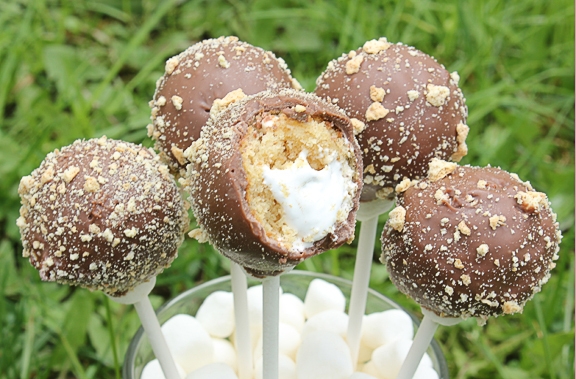 I've had these S'more pops on my list of to try for a long time now. 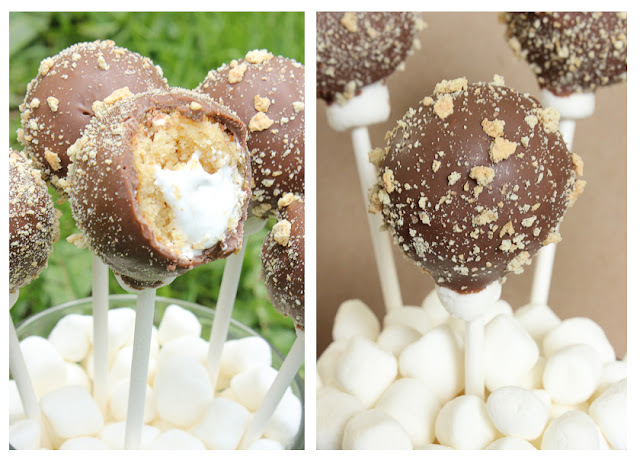 S'more desserts have became a sensation the last few years as well as cake pops so why not mix them together? Trying not to stray far from the original I decided to use my graham cracker cake, stuff with gooey marsmallow fluff, and cover in chocolate. Perfecton. 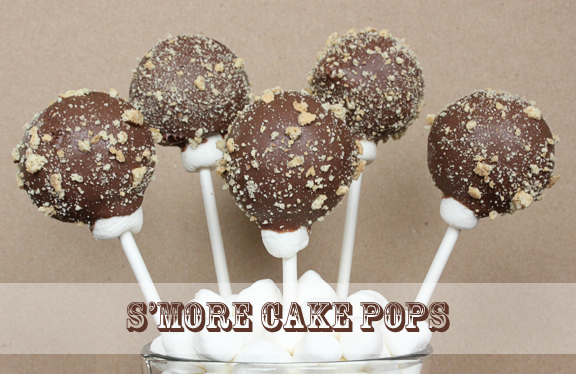 If your dying to give these cake pops a try, your gonna need a cakepop maker. If you don't have one yet, I got mine at Kohls on sale for $20.00 bucks. So go get one, but don't tell your hubby I said so ;). Step 1: Crush graham cracker. You want it to be really fine! Since my magic bullet decided it's no longer magic I placed an entire sleeve of graham crackers in a ziplock and used the edge of a glass bowl to mash it up really really well. Your going to need 1 1/2 cup. Step 2: In a seperate bowl mix together finely crushed graham cracker, flour, baking powder, and salt. Set aside. Step 3: In another bowl, with a electic mixer beat together butter and white sugar until fluffly. 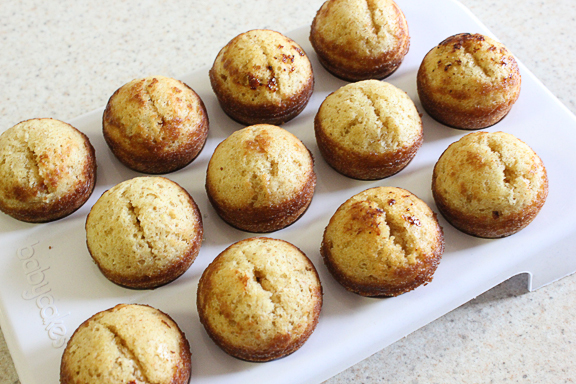 Add eggs, mix, add brown sugar, mix, then add vanilla extract. Step 4: Slowly add in the flour mixture then milk. 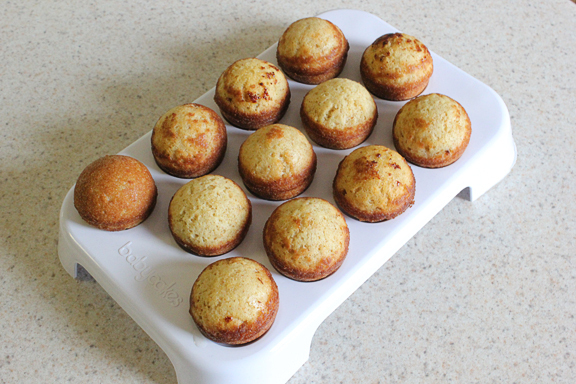 Step 5: Plug in your baby cakes maker. While your waiting pour cake pop batter into a ziplock bag. Step 6: When the ready light is green cut the tip off the ziplock and fill each cake pop hole level to the top, work quickly! 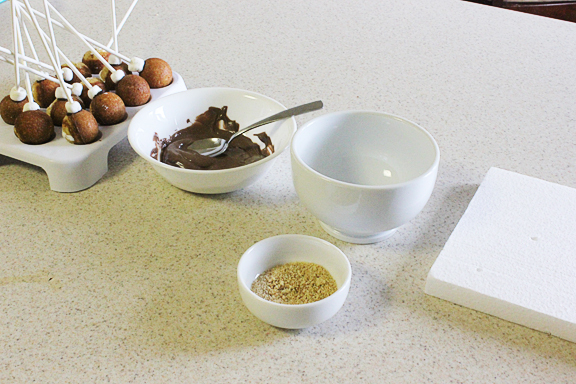 Step 7: Let cake pops bake for 4-5 minutes. Then pull out and let cool. Repeat 6 & 7 again for the second dozen. Now your ready t smore-ify these babies. Piping marshmallow fluff is HARD! So this is how I stuffed them. Put 1 cup of marshmallow fluff into a ziplock back and cut the tip off. Then cut a slit in the top of each cake pop wiggling the blade tip around to open up some room. 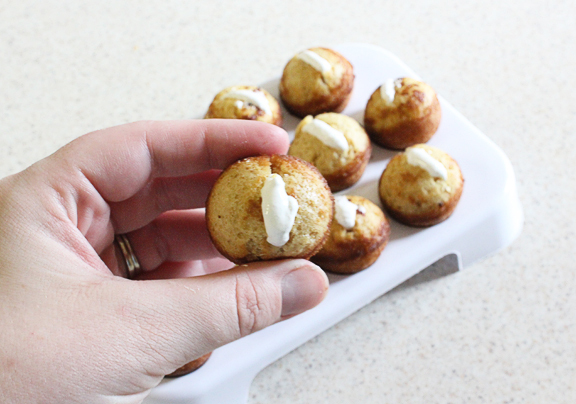 Now hold the cake pop with your fingers and the seams and push open, now sqeeze some marshmallow fluff in there. Don't be cheap! Then take your knife and gently scrap off or smooth out the the excess marshmallow. 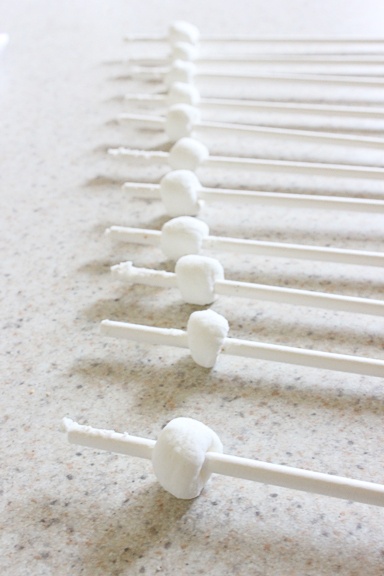 When your finished turn each cake pop on it's side so your not poking the stick through the open area. Now slip a mini marshemellow about 3/4 of an inch down each stick. Of course you don't have to do this but it really helps the cake pop stay put. 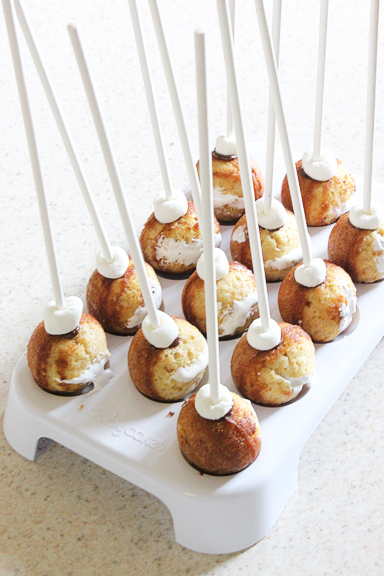 I didn't have any slide or break, wish I could use marshmallows on all cake pops :). 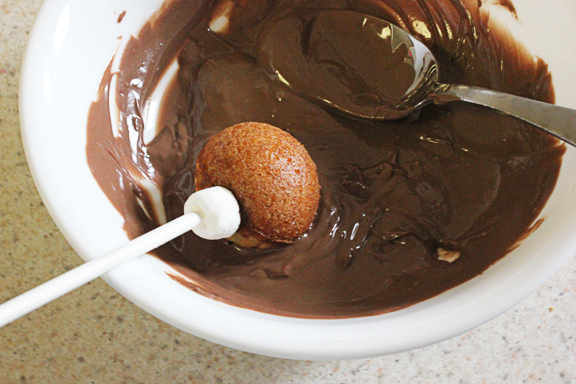 Now melt just a little bit of chocolate, an dip each sitck in it and then into te cake pop. This works just like glue. Now stick them in th freezer to harden up a bit. 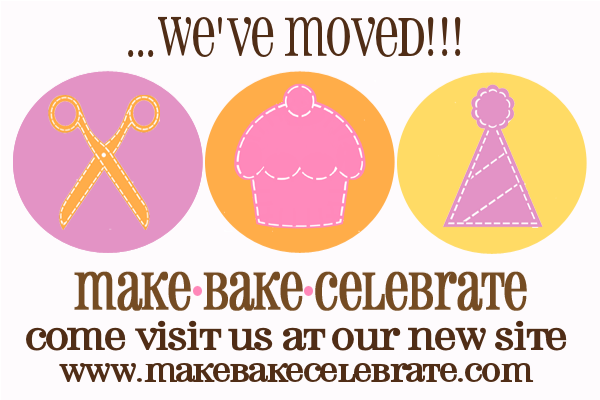 While they are in the freezer you can melt your choclate and set up your workspace. 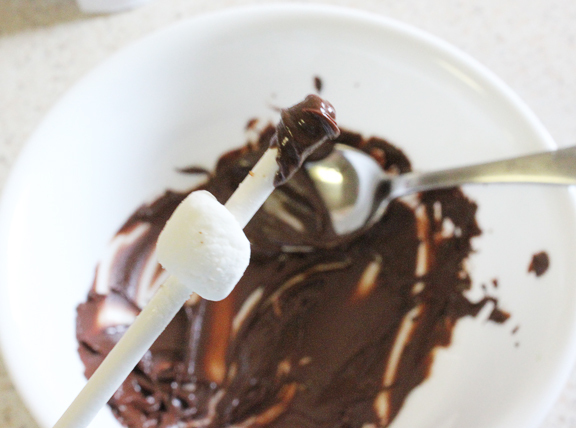 Melt chocolate in the microwave for 30 seconds, and then 15 second spurts stiring in between, until complely melted. And then crush up your two extra crackers from to sprinkle on. They don't have to be fine this time. Since you have to move quick with cake pops I like to put everything in line. And of course you'll need a piece of styrofoam or something to stick them in to dry. Pull your cake pops out of the freezer and let chill for about a minute. 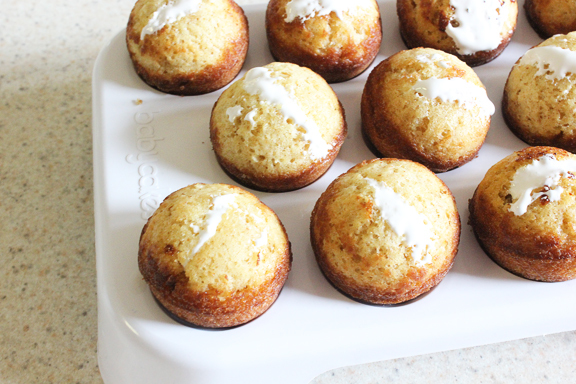 Then cover your cake pops by placing the pop on the side of the bowl and swirl, instead of actually dipping. 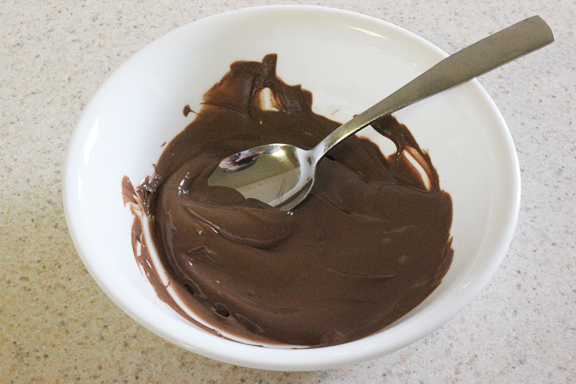 Then lightly swirl and tap on the edge to smooth out the chocolate. Before the chocolate sets sprinkle with you graham cracker pieces. Now just stick them in some styrofoam to set up, and a few minutes later they'll be ready! My daughter has been asking for a camping party this summer...these will have to go on the menu! And did I mention they were 1000 times cleaner to give my two year olds then an actual smore? Yay! Jeans and a t-shirt makeover!